There is an urgent need to focus on Canadian youth’s well-being and healthy relationships. We should be concerned that the quality of relationships for Canadian youth is among the lowest in developed countries - 18th out of 21 (see the Unicef report). Even more troubling - suicide is the second leading cause of death for adolescents aged 10-24 years. In the past year alone, several high profile and tragic events of youth suicide have brought heightened national attention to the issue of youth mental health, bullying and suicide prevention. In fact, both suicide and mental health have been highlighted as key public health issues. In support of federal efforts on mental health, PREVNet is launching a national youth advisory network that will focus on bullying prevention. Research shows that peers play a crucial role in both fuelling and preventing bullying. 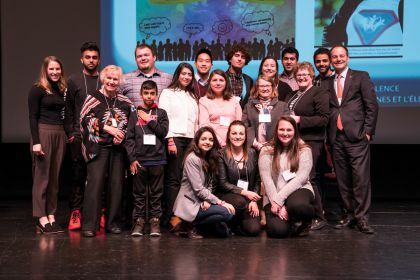 PREVNet’s Youth Advisory Group will aim to decrease bullying among youth, support crimes prevention and improve mental health and well-being by focusing on youth involvement. In order to address youth violence and victimization in an effective manner, youth must be engaged in program and policy development and need to be encouraged to work with adult experts in the field so we can all create a nation of caring, respectful and inclusive youth. PREVNet’s National Youth Advisory Committee (NYAC) is comprised of youth members from PREVNet's Partner Organizations including: Canadian Red Cross, Jer’s Vision, Public Health Agency of Canada, Royal Canadian Mounted Police, The Students Commission, Centre of Excellence for Youth Engagement, and YOUCAN. The NYAC has recently been involved in a social media and safety survey that was part of a research initiative aimed at understanding how young people use social media, especially regarding online safety and bullying.